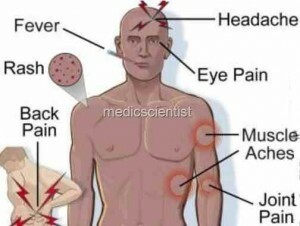 Typhoid fever is an acute illness associated with fever caused by theSalmonella typhi bacteria. It can also be caused by Salmonella paratyphi, a related bacterium that usually causes a less severe illness. The bacteria are deposited in water or food by a human carrier and are then spread to other people in the area. After the ingestion of contaminated food or water, the Salmonellabacteria invade the small intestine and enter the bloodstream temporarily. The bacteria are carried by white blood cells in the liver,spleen, and bone marrow, where they multiply and reenter the bloodstream. People develop symptoms, including fever, at this point. Bacteria invade the gallbladder, biliary system, and the lymphatic tissue of the bowel. Here, they multiply in high numbers. The bacteria pass into the intestinal tract and can be identified in stool samples. If a test result isn't clear, blood samples will be taken to make a diagnosis. Typhoid fever is caused by Salmonellae typhi bacteria. Diagnosis of typhoid fever is made when the Salmonella bacteria are detected with a stool culture. Typhoid fever is treated with antibiotics which kill the Salmonellabacteria. Prior to the use of antibiotics, the fatality rate was 20%. Death occurred from overwhelming infection, pneumonia, intestinal bleeding, or intestinal perforation. With antibiotics and supportive care, mortality has been reduced to 1%-2%. With appropriate antibiotic therapy, there is usually improvement within one to two days and recovery within seven to 10 days.